I’ve been playing with tablets a lot at work and thought that I would explore Google’s voice to text functionality that’s built into the latest Android operating systems.there are several ways to use Google’s voice to text feature. The most common is voice search. People using an Android phone will find this particularly helpful if they are looking for information while driving or otherwise on the day. I am NOT going to edit this post at all so what you see is what you get screw ups and all. 1 interesting thing is that I can say words for punctuation or bad thing such as.this makes it hard to actually type the word. Or say enter. then I get to come and enter meeting new line. I talk a lot in front of people as part of my job so I’ve learned to speak clearly and a little bit more slowly than with conversationally. I’m speaking a little bit slower than normal but about the same volume and tone as I do when I’m speaking to the audience. I’m going to pick the pizza up a little bit and see if the text to speech can keep up. recently we’ve been playing a lot of time with games at the house in a few new board games as well. Before him that we playing a lot recently is race to the galaxy. I guess it’s a card game technically but be played on a table so what the hell. 1 thing we’ve noticed is that it’s a lot more fun to play certain games on a tablet or Lectronic Lee band in the real life version. The I OS version of ascension for example is a lot more fun and easier to manage in virtual cards. of course 1 of the downsides to a session is that is all I owe you as only. This may change by the end of the year as the people who are making ascension are hand to find a Windows and Android version as well as bring additional features such as tournament play in a campaign mode to the digital version of Ascension. look for future gibberish post about the Ascension Kickstarter but for now I just wanted something to talk about. overall I’m pretty impressed with Google’s text in speech converter. 1 of the things I like is how it will correct itself as it gets more context as I speak. The weakness to this of course is that I don’t speak very clearly on man and so I don’t get it a lot to work with. I also feel bad when I stumble over my words and it causes to speech to text converter to make a mistake. It’s not your fault little dude. I don’t know if I would write many of my post this way what is an interesting view into the same technology they will soon power Google class which is a project that I am very interested in and I think will change the way we interact with computers. A big part in making Google glass affective is the voice to text recognition and it Google can get this part right the on screen display Google wife is just 1 more drop in the bucket. I’ve been playing with tablets a lot at work and thought that I would explore Google’s voice to text functionality that’s built into the latest Android operating systems. space, There are several ways to use Google’s voice to text feature. The most common is voice search. People using an Android phone will find this particularly helpful if they are looking for information while driving or otherwise on the go. I am lowercase “not” going to edit this post at all so what you see is what you get screw ups and all. One interesting thing is that I can say words for punctuation or as a command such as period. This makes it hard to actually type the word period. Or say enter. then ??? and enters a new line. I talk a lot in front of people as part of my job so I’ve learned to speak clearly and a little bit more slowly than during conversation. I’m speaking a little bit slower than normal but about the same volume and tone as I do when I’m speaking to an audience. I’m going to pick the pace up a little bit and see if the text to speech can keep up. Recently we’ve been playing a lot of tablet games at the house and a few new board games as well. Another game that we play a lot recently is Race to the Galaxy. I guess it’s a card game technically but can played on a table so what the hell. One thing we’ve noticed is that it’s a lot more fun to play certain games on a tablet or electronic version than the real life version. The I OS version of ascension for example is a lot more fun and easier to manage in virtual cards. Of course one of the downsides to Ascension is that it is iOS only. This may change by the end of the year as the people who are making ascension are kickstarting a Windows and Android version as well as bring additional features such as tournament play and a campaign mode to the digital version of Ascension. 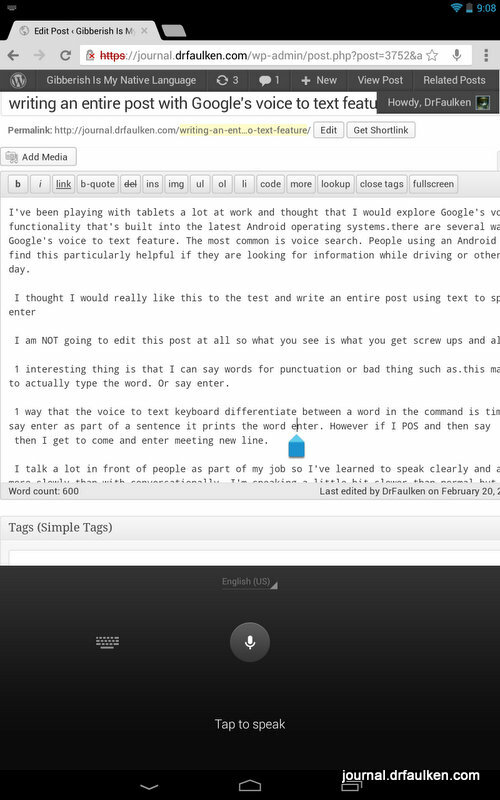 Overall I’m pretty impressed with Google’s speech in text converter. One of the things I like is how it will correct itself as it gets more context as I speak. The weakness to this of course is that I don’t speak very clearly on demand and so I don’t give it a lot to work with. I also feel bad when I stumble over my words and it causes to speech to text converter to make a mistake. It’s not your fault little dude. I don’t know if I would write many of my posts this way but it is an interesting view into the same technology they will soon power Google Glass which is a project that I am very interested in and I think will change the way we interact with computers. A big part in making Google glass effective is the voice to text recognition and if Google can get this part right the on screen display ?? ?<?strong> is just one more drop in the bucket.